Flip and Econobum Now Available! Nicki's Mom of the Month! Winner of 3rd Weekly Giveaway (Oct 9th-Oct 15th)! Winner of 2nd Weekly Giveaway! Yet one more contributing writer! NEW 15 Day Wash™ Program launched today!! Another Nicki's blogger introduces herself! Got BabyLegs?? Show 'em off! Winners of 1st Weekly Giveaway! Baby BeeHinds Wool Diaper Cover is made from 100% woolen fabric. It has a double layer in the "wet zone" to provide extra protection from leaks! Use the Baby BeeHinds Wool Diaper Cover over cloth prefolds, fitted diapers, or contour diapers. Wool is a popular choice for so many mothers because it is the most breathable natural fiber your baby can wear! Moisture from a wet diaper evaporates through the wool fibers so baby stays more comfortable. Wearing the Baby BeeHinds Wool Diaper Cover at night when your baby wears the same diaper for a longer time, will keep your baby drier and more comfortable because moisture evaporates. Baby BeeHinds Wool Diaper Covers have elasticized leg openings, are bound in wool ribbing, uses superior High-Tech Velcro that last longer, and are fully machine washable in a lingerie bag (cold water only). Only $24.00/each with Free Shipping! To enter to win your free Baby Beehinds Wool Diaper Cover you will receive ONE entry for EACH option below (you MUST leave a comment for each option saying what you did and where). This means you can get multiple entries increasing your chance to WIN! (each "Weekly Giveaway" may be different): 1. Become a subscriber of Nicki's Diapers Blog or if you already are post it 2. Become a Fan of Nicki's Diapers Facebook page 3. Post a comment on Facebook about Nicki's Diapers including a link to any page on Nicki's Diapers 4. Follow nickisdiapers on Twitter 5. Tweet about Nicki's Diapers including a link to any page on Nicki's Diapers 6. Blog about Nicki's Diapers including a link to any page on Nicki's Diapers 7. Talk about Nicki's Diapers on a Forum including a link to any page on Nicki's Diapers 8. Grab one of our buttons and put it on your blog. *Contest ends Nov. 5th at midnight and winners will be posted on Friday Nov. 6th. Winners generated by random.org Winners must notify nicki@nickisdiapers.com within 1 week. Congrats to the winner of our 5th weekly giveaway! Katie and Thang wins a bumGenius Flip with stay dry insert!! Please email nicki@nickisdiapers.com so we can get you your prize! Sigma Diaper Sprayer!! This week only $24.99! Over 16% off!! All "Items of the Week" run from Wed to Wed. Contrary to popular belief, it is no longer recommended to store your dirty cloth diapers in a wet pail. Good thing, because not only are they messy, but they are a breeding ground for bacteria and they are also a drowning hazard for small children! There are two easy ways to store your dirty diapers while you’re waiting for wash day. You can use a flip top pail with a pail liner, or you can use a large hanging wetbag. If you’re going to use a pail, it’s nice to have 2 pail liners so that you can have one in the pail and one in the wash. Planetwise pail liners are seam sealed to hold in wetness and stink! They come in a lot of fun colors, too, so you can match them to the nursery! There is a special little place on the diaper pail to hold Deodisks. They absorb any lingering odor and leave a fresh, but not overwhelming, citrus scent. One Deodisk lasts from 3-4 weeks and they come in packages of 5 for $3.25. If you’re looking something to tackle a really stinky diaper, try sprinkling some Fluff Dust on it when you throw it in the pail. It’s an all natural deodorizer than comes in a variety of scents like Fresh Picked Rose and California Fields. It also does double duty and can be used as a carpet or litterbox deodorizer or a scrub for your bathroom sink! If you’re looking to save a little space or just want something a little more visually appealing than a diaper pail, a hanging wetbag may be for you! These large wetbags can be hung off a doorknob or on the end of the changing table and you just toss the dirty diapers in it! I especially like the Planetwise hanging wet/dry bags because they zip shut and have an extra dry pocket to store things like ointment and wipes. The prints are adorable, too! You've got dirty diapers and we've got the solution! Questions? Never hesitate to ask! 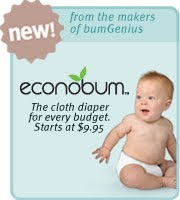 bumGenius! has just come out with their new Flip System! It is as no mess, no fuss, no worries way to cloth diaper! It is so easy to use - just toss the used insert into your diaper pail and replace the insert with a clean one reusing the cover. 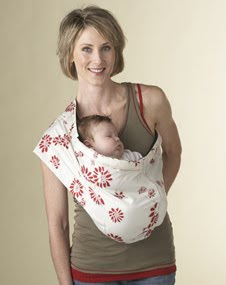 The 3x3 adjustable snap system on the cover and will adjust to fit most babies from 7-35 pounds. Each Flip set comes with your choice of a Moonbeam, Zinnia or Ribbit one-size cover and you may choose a one-size Stay-Dry insert or a 100% Oeko-Tex Certified Organic Cotton insert. The Stay-Dry inserts are made of 3 absorbent layers of microfiber and a smooth stay-dry suede that wicks away moisture from your baby's skin. The Organic Cotton inserts are vey soft and ultra-absorbent. Disposable inserts are also available to use when you travel. They are dye free, fragrance free and have the Oeko-Tex certification. Disposable inserts are sold in packages of 18. It is recommended to use 2 inserts when diapering a toddler or heavy wetter overnight. Extra inserts are sold separately. The Flip System is available in individual sets or day packs. An individual set includes 1 Flip cover and 1 insert of your choice (Stay-Dry or Organic). A day pack includes 2 one-size Flip covers (2 Moonbeam in the boy package and 2 Zinnia in the girl package) and your choice of 6 Stay-Dry one-size Flip inserts or 6 100% Oeko-Tex certified organic cotton one-size inserts. Only $16.95/each for stay dry and $19.95/each for organic PLUS Free Shipping! To enter to win your free bumGenius Flip with stay dry insert you will receive ONE entry for EACH option below (you MUST leave a comment for each option saying what you did and where). This means you can get multiple entries increasing your chance to WIN! (each "Weekly Giveaway" may be different): 1. Become a subscriber of Nicki's Diapers Blog or if you already are post it 2. Become a Fan of Nicki's Diapers Facebook page 3. Post a comment on Facebook about Nicki's Diapers including a link to any page on Nicki's Diapers 4. Follow nickisdiapers on Twitter 5. Tweet about Nicki's Diapers including a link to any page on Nicki's Diapers 6. Blog about Nicki's Diapers including a link to any page on Nicki's Diapers 7. Talk about Nicki's Diapers on a Forum including a link to any page on Nicki's Diapers 8. Grab one of our buttons and put it on your blog. *Contest ends Oct 29th at midnight and winners will be posted on Friday Oct 30th. Winners generated by random.org Winners must notify nicki@nickisdiapers.com within 1 week. Winner of 4th Weekly Giveaway (Oct 16th-Oct 22nd)! Congrats to the winner of our 4th weekly giveaway! Christian, Rachel and Savannah Baldree wins a Smartipants One Size Pocket Diaper!! Please email nicki@nickisdiapers.com so we can get you your prize! Flip and Econobum now available to order!! HUGE shipment arriving Friday. Be the first to try these two new diapers. Blueberry One Size Coveralls!! This week only $14.97 and free shipping! All "Items of the Week" run from Wed to Wed.
Nicki's Diapers Fall CLEARANCE Event! Huge Discounts!! We have added so many new items that we need to make some room! Pork Chop Kids thigh high socks - oh so cute! Hygeia Breastpumps - FDA certified for multi users!! Sleep Items - Aden & Anais blankets, Snug & Tug Swaddle Blanket, and more! Diaper Trial Program - 15-Day Wash...Try...Wash...Love...or Return! Bargain Nook section highlighting all of our budget items! FREE gift included with all orders over $100! Item of the Week - every week a new item on sale. Wed is DOUBLE DEAL DAY! Weekly Giveaway - easy to enter just visit our new blog! NEW Return/Exchange Policy making life easier for you! As always largest selection instock shipping fast with FREE SHIPPING on many items PLUS all orders over $75.00!! Are you a clothing diapering Mom? Do you love shopping at Nicki's? Would you like to see you and your child(ren's) faces featured on our blog? Sign up to be the next Nicki's "Mom of the Month!" You'll answer a few fun questions about yourself (hobbies, favorite meal to cook, etc.) and about your experiences clothing diapering (why you started, favorite diapers, etc.) and submit a picture of yourself and your children to show off to all our blog readers! Send us a brief description of yourself and why you'd like to be featured! We'll select one mom every month and we'll email you with our questions at the time you're chosen! Entries to: annie@nickisdiapers.com. Can't wait to see you on our blog! If you’re pregnant and planning to cloth diaper your new little one, this post is for you! I’m going to tell you everything you need to get through the first few months of cloth diapering by building what I believe to be the ultimate newborn diaper stash! Actually, I’m going to show you two different examples of ultimate newborn stashes, the first one will be the less expensive route and the second one will be a little bit more expensive. First, a few things… We recommend washing your diapers every other day. This means you’ll need 2 days worth of diapers, plus a few extras for your baby to wear when you’re washing and for those diaper changes that they pee when you’re changing them. So if we’re considering a newborn, you’ll probably need somewhere between 24 and 36 diapers. It’s also important to note that while many one-size diapers say they fit from birth though potty training, most baby's thighs aren't quite large enough to fill them out till about 10 pounds and they may leak through the legs till they're a bit bigger. If you want to start CDing before they reach 10 pounds, the 2 options below are the most popular route with Nicki’s customers. Newborn Stash #1 –The Cheapest Route! Part of the reason that I cloth diaper is to save money, so when we were getting ready to have our second son, we wanted to go the cheaper route for his newborn diapers. We knew our younger guy wouldn’t fit into his older brother’s OS pockets for at least a month, but we didn’t want to be buying and throwing away disposables in that time. Some people are intimidated by prefolds, but having used them on my toddler, I knew I could handle them on a newborn. Let me tell you, putting them on a newborn is so much easier than a wiggly toddler! At night I preferred the Kissaluvs because they were just a tad easier to be putting on in a more sleep-deprived state. As far as covers go, our most popular for a newborn at the NB and small Proraps and the Thirsties XS. Both of these covers have the extra leg gusset that is perfect for holding in the NB poop. Some people prefer the ease of an all-in-one or a pocket right from the get-go. If you want something that is most like a disposable, a size all-in-one or a sized pocket might be what you’re looking for. The most popular sized AIO’s and pockets for newborns are BumGenius 3.0 XS (or small) All-In-Ones and Fuzzi Bunz XS pocket diapers. You will need a few accessories to complete your newborn stash, including a diaper pail, 2 pail liners, a few wetbags, some cloth wipes and some wipe solution. That should do it! You’re all ready for your new little one to arrive, at least in the cloth diaper department anyhow! Oh, I should add…since they grow so fast when they’re little, they’ll be moving up into the next size diapers (or into OS diapers) before you know it! If you’re done having children or don’t plan to hold onto the small diapers for the next baby, you can resell your diapers at Under My Crib and get back some of your money to buy the next size diaper! NEW Smartipants One Size Pocket Diaper (your choice of color)!! Smartipants One Size Pocket Diapers are economical, environmentally friendly, easy to care for and very convenient! This pocket diaper has a new design so you can just place the absorbent insert into either side of the sleeve. The patented Smart Sleeve makes sure the insert will stay in place until you take it off your baby, but you don't have to take that soiled insert out of the pocket - it comes out in the wash! Smartipants Diapers also feature Leak-Guard Technology. That keeps moisture in and your baby dry! The "breathable" fibers are free from any chemicals or irritants. Smartipants Diapers are designed to fit babies 7-35 pounds, so they will grow with your baby. The long lasting snaps are guaranteed for 2 years! Gently pleated stretch-elastic on the legs and back give this diaper a comfortable, snug fit to contain messes. The Smartipants Diaper has a stay-dry lining and soft, waterproof outer fabric that is leak-proof so an additional cover is not needed. When you buy a single Smartipants starter package, you will get 1 Smartipants reusable diaper and 1 Smart Sleeve Insert. Save money by choosing a package deal. You can get 3 diapers with inserts for $39.95, if you bought them singly they would cost $44.85! If you choose a package of Smartipants One Size Pocket Diapers, you will receive 1 Smart Sleeve Insert with each diaper in the package. The Smart Sleeve Inserts are made from a Polyester-Nylon blend that is super-soft and very absorbent. If you would like extra inserts for naptime or overnight, 10 packs are available. Only $14.95/each or 3 or more for only $13.32/each PLUS Free Shipping! To enter to win your free Smartipants One Size Pocket Diaper you will receive ONE entry for EACH option below (you MUST leave a comment for each option saying what you did and where). This means you can get multiple entries increasing your chance to WIN! (each "Weekly Giveaway" may be different): 1. Become a subscriber of Nicki's Diapers Blog or if you already are post it 2. Become a Fan of Nicki's Diapers Facebook page 3. Post a comment on Facebook about Nicki's Diapers including a link to any page on Nicki's Diapers 4. Follow nickisdiapers on Twitter 5. Tweet about Nicki's Diapers including a link to any page on Nicki's Diapers 6. Blog about Nicki's Diapers including a link to any page on Nicki's Diapers 7. Talk about Nicki's Diapers on a Forum including a link to any page on Nicki's Diapers 8. Grab one of our buttons and put it on your blog. *Contest ends Oct 22nd at midnight and winners will be posted on Friday Oct 23rd. Winners generated by random.org Winners must notify nicki@nickisdiapers.com within 1 week. Congrats to the winner of our 3rd weekly giveaway! mommasboys wins Tweedle Bugs One Size Pocket Diaper Please email nicki@nickisdiapers.com so we can get you your prize! Hotslings Baby Carriers!! This week only $37.95-$49.95 (depending on style) and free shipping! Do you live in the Madison, WI area and are you looking for great deals on gently used children's and maternity items? Check out the Just Between Friends Sale on the west-side this weekend, October 16th-18th! You'll find things like clothing, accessories, maternity items, nursery gear, books, strollers, TOYS!, coats, baby carriers, carseats, highchairs, and furniture! The sale is at the MAC Sports Center in Verona, WI. Friday from 9:00am-12:00pm shoppers with children can shop and 12:00pm-7:00pm the sale is open to the public! On Saturday the sale is open to the public from 9:00am-6:00pm. On Sunday from 11:00am-2:00pm the half-price sale is open to the public! Check out their website for more information! www.jbfsale.com This is a great opportunity to find great deals on things for your little one and also give back to the community. All the consignors are local parents and the sale also benefits local charities! So your best friend thinks you’re off your rocker. She can’t believe that you’re going to use cloth diapers. She says, “Eww those are gross and I don’t have the time to do all that extra laundry”. Your grandma tells you,“They are way too much work, I know! I did them back in the day and don’t you know those pins poked your aunts and uncles more times than I can count”. Aunt Candice says, “Those wet pails are such a pain and they stink.” Your mom says, “Don’t they cost a lot of money? You’re not saving because it’s all being spent on your water bill.” And well you just know that they smell bad. When I first thought about doing cloth at the prompting of my friend Corey, everyone was telling me not to but her. So, I did my research and asked Annie and Corey both a million questions. When I finally decided to try it, I had all of these people coming at me telling me not to do it and that I’d “never make it cloth diapering” and no ammo to fend them off. Let’s start with what bothered me the most…The Smell. Oh Lordy was I afraid of the smell. Turns out they don’t smell at all if you wash them correctly. I can remember smelling Annie and Corey’s diapers and saying “Wow, they really don’t smell.” They must have thought I was crazy burying my face in a Fuzzibunz and taking a big whiff. The proof for me was in the diaper. Have your friends smell them. Seriously, they don’t smell like anything. They are just as clean, if not cleaner than the clothes you wear. If your baby has a blow out in disposables, don’t you just wash their clothes? Of course you do, and it’s clean and it will be worn again. Isn’t the water in the diaper pail dangerous and smelly? Cloth diapering has changed so much. Gone are the days of diaper pins, wet pails, and only using prefolds because that’s all that was available. Now we get choices; velcro or snaps, flowers or cow prints, All-in-Ones or Fitteds and Covers. Wet pails probably did stink and they allowed for bacteria to grow. Now we use a diaper pail made with odor eating plastic, no water, and Planet Wise Pail Liners, which makes for better smelling diapers and houses all around. If you do notice a smell in the pail, there are products such as Fluff Dust and Deo-Disks that can help eliminate that for you. Oh the laundry! How will I ever handle the laundry? If you remember nothing else about me, remember this…I loathe laundry! I detest the smell of dirty clothes, washing them, drying them and especially folding and putting them away. Needless to say I have a hard time keeping up with my regular wash but my diapers are always clean. All you do is dump the diapers in your machine set it for a cold rinse, come back, add some detergent, set it to do a hot wash/cold rinse, and then one more rinse and they’re done. If you have a new washer you can actually program it to do all of that for you. Set it and forget it! There is something so gratifying about having them all washed, dried, and ready to go! The next big thing for me was the cost. And yes, initially they do cost more up front but the money you save in the long run is crazy. HERE is a Cloth Diaper Calculator that will help you see exactly how much money you can save. This was big for me and my husband and ultimately was a deciding factor in our choice to use cloth. I invested $364 (which is more than I needed to) to start. I have since sold some of my diapers (you can too at www.UnderMyCrib.com ) and made back $85. I don’t know anyone that has ever made money back on disposables, do you? After all of this, who wouldn’t want to cloth diaper? Tweedle Bugs One Size Snap Pocket Diapers are one of the easiest and most economical diapering systems available! There is an opening in the front and rear for easy insert stuffing and removal. The double row of snaps makes adjusting this diaper to fit around your baby's waist and legs simple. The outside of the Tweedle Bugs Diaper is made of waterproof PUL and the inside is lined with soft, stain resistant polyester micro-fleece. The Tweedle Bugs Pocket Diaper will fit babies from 7-35 pounds. Each diaper comes with 1 adjustable insert and 1 doubler to increase absorbency. The Tweedle Bugs Minky Moo One Size Pocket Diaper is made of a minky, velvety exterior fabric that is a water proof minky PUL. It is lined with a stain resistant no-pile suede cloth fabric. There is an opening in the rear for stuffing and removing the insert. The Minky Moo also has the 3 row snap down system that allows you to adjust the rise so it will fit babies from 7-35 pounds. There is a single row of snaps for adjusting the fit around your baby's waist. 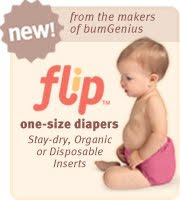 Only $12.95/each with two free inserts PLUS Free Shipping on all Pocket Diapers at Nicki's Diapers! To enter to win your free Tweedle Bug One Size Pocket Diaper you will receive ONE entry for EACH option below (you MUST leave a comment for each option saying what you did and where). This means you can get multiple entries increasing your chance to WIN! (each "Weekly Giveaway" may be different): 1. Become a subscriber of Nicki's Diapers Blog 2. Become a Fan of Nicki's Diapers Facebook page 3. Post a comment on Facebook about Nicki's Diapers including a link to any page on Nicki's Diapers 4. Follow nickisdiapers on Twitter 5. Tweet about Nicki's Diapers including a link to any page on Nicki's Diapers 6. Blog about Nicki's Diapers including a link to any page on Nicki's Diapers 7. Talk about Nicki's Diapers on a Forum including a link to any page on Nicki's Diapers 8. Grab one of our buttons and put it on your blog. *Contest ends Oct 15th at midnight and winners will be posted on Friday Oct 16th. Winners generated by random.org Winners must notify nicki@nickisdiapers.com within 1 week. Congrats to the winner of our 2nd weekly giveaway! Erin wins Kissaluvs Hybrid One Size Contour Diaper Please email nicki@nickisdiapers.com so we can get you your prize! If you’re new to cloth diapering, or can think back to when you were, you know how confusing it can be. There are so many different kinds of diapers to choose from, not to mention all the accessories. You probably have a million new terms running through your head like prefolds, all-in-one, fitted, insert, liner, and wet-bag, to name a few. Hopefully I can help you clear up any confusion and you can make the right choice about which type of diaper(s) will work best for your situation! First, let’s talk types of diapers. We’ll start with the most basic (and least expensive) and move up to the most expensive and most like disposable diapers. Prefolds- Before knowing much about cloth diapering, you probably thought that cloth diapers were all what your mom and grandma used back in the day with pins and plastic pants. Those diapers are still around and are a lot easier to use than you probably imagine! Gone are the days of pins and plastic pants, though! We’ll talk about that in a second. Prefolds are rectangular diapers with an absorbent pad sewn in. They come in a variety of sizes and thickness as well in bleached or unbleached. Prefolds need to be folded and secure with a Snappi (no more pins, remember?!) or just trifolded. Prefolds are not waterproof so they need to have a waterproof cover put over them. Fitteds- A fitted diaper is tailored with elastic around the legs and waist to fit closely to your baby’s body. They close with either snaps or Velcro and require no folding. These do require a waterproof cover. Pockets- Pocket diapers are perhaps the most popular and well known type of diapers in the cloth diapering world with big brands like Bum Genius, Fuzzi Bunz, and Haute Pockets leading the way. The type of diaper is essentially a waterproof diaper cover with a pocket opening that you stuff a prefold or a specially designed insert into to absorb liquid. All-In-Ones- If you’re looking for something that is most like a disposable diaper, apart from the fact that you wash it, you’re probably looking for an all-in-one diaper. These diapers are an absorbent inner material sewn onto a waterproof cover. They close with snaps or Velcro. Now that you’ve got a grasp on the types of different diapers, let’s look at diapering accessories like inserts and doubles, liners, and wetbags. Inserts and Doublers- A diaper insert is a pad that is used to add extra absorbency without adding bulk and is usually about 3"X11". Inserts are usually used for babies under 6 months old. A diaper doubler is a larger pad that is used to add extra absorbency without adding bulk and is usually 4"x14". Doublers are usually used for older/larger babies. Liners- Generally, a liner is a piece of material (most likely fleece, silk, or a flushable material) that sits between your baby’s skin and the diaper. Liners do not add extra absorbancy but perform other duties! A flushable liner can be used to catch solid poop and can just be flipped off into the toilet as oppose to scraping or using a sprayer. A fleece liner allows moisture to pass through it, being absorbed by the diaper, but keeps baby’s skin feeling dry. Poop is also easier to remove from fleece than from cotton (like a prefold). A raw silk liner also helps keep baby’s skin drier and also has anti-microbial properties that may keep diaper rash and yeast at bay. Wetbags- A wetbag is essential to all cloth diaperers! Toss your dirty and wet diapers into a wetbag to prevent smell and moisture from getting on other things in your diaper bag. You can also loop a hanging wetbag over a doorknob and use it the same way you’d use a diaper pail. Planetwise wetbags and wet/dry bags are specially seam sealed to keep ALL moisture and smell contained! When it’s broken down, it seems a lot easier to grasp, doesn’t it? If you’re still confused or have any questions at all, never hesitate to call us or drop us an email! You can even ask questions in the “comments”. Better yet, if you’re nearby, Nicki does a FREE Cloth Diapering 101 Class at our Madison location where you can see and TOUCH all the diapers in person! Keep an eye on our classes calendar for when the next one will be and come check it out! Hi, I’m Gracie. My husband Daron and I have two children, Zoe who will be 4 in December and Soren who is only 7wks old. I am brand new to cloth diapering and only started when my son was born. At first, I was so completely overwhelmed by the whole cloth diapering world that I almost didn’t do it. There is just so much to learn. When I started telling people that I was thinking about it, no one thought I would or could. One day when I was talking to my mom, she laughed at me and said “Gracie, you don’t do the laundry now, what makes you think you can keep up with cloth?” In my head I thought, “She’s right! What did I get myself into?” But I couldn’t let other people think I couldn’t do it, so I jumped in! I went to Nicki’s store in New Glarus with Annie and Corey and bought Snappis, prefolds, Swaddlebees covers, a couple of Haute Pockets, two Planet Wise wet bags, and a few other things. Me and my pride were going to do this! My first week of cloth diapering was a disaster! I didn’t know what I was doing. I was so sure it was going to be just like disposables just with added washing. How hard can this be? Plus I wanted to have Soren in cloth when I went home to NY to visit my family since I talked it up so much. I had to go home with him IN cloth to save face right? So I got out my Kissaluv 0 and a Swaddlebees ABC wrap and put it on. Within the hour Soren was soaked. Hmm, that’s strange Corey swears by these and her kids never leaked in them. So I tried again (remember my pride is hanging in the balance), and again, and again! Over and over I tried these diapers and every time he leaked through them. All the while I’m thinking to myself, “Boy this design is horrible. Why would they make it snap together like this and have these flaps on the top?” Finally out of desperation I decided to take pictures and send them to Corey and Annie to see if it’s user error. Check it out… Sure enough, I had put the darn thing on inside out! Best part of this story is I went home with him in cloth but leaking at every diaper change. My family is thoroughly convinced I’ve lost it. But I didn’t give up! Once we fixed this little inside out issue, it’s been smooth sailing. Honestly though, I cloth diaper because I want to save money, they’re fun and different from the norm and I love the look when I tell people. It’s a great conversation starter and I love to talk! I hope you’ll find some humor in my stories and my mistakes. Try cloth diapers for 15 days on us. Try, wash, love, or return them for store credit. This is your opportunity to find the right cloth diapers for your baby with no risk. If you decide cloth diapering isn't for you (but we are sure you will love it!) return for store credit and shop our great selection of other products (we have tons of nursing supplies, baby carriers, shoes, and more). Swaddlebees ABC Wraps!! This week only $13.49 and free shipping! All "Items of the Week" run from Wed to Wed.
Two years ago I never would have guessed I would be cloth diapering my children, let alone writing on a blog about it. When I first considered cloth, my oldest daughter was only a few months old. I remember hearing someone say they were having a second child and the cost associated with the baby would be very low since they would be reusing the diapers from their first child, I was intrigued. I started looking into cloth due to the cost savings but I soon decided that it was too difficult and looked very overwhelming. I kept it in the back of my mind but I was not ready to begin yet. When my daughter, Gabby turned 15 months we had some exciting news, we were expecting another child! This seemed like the perfect time to start cloth since I knew I would want to try it with my second child I felt like it would be ideal to test drive it on my toddler. I went online and started researching what I wanted to buy. It all still seemed overwhelming for me so I decided to start off with a little of a few different kinds of diapers instead of buying a large lot of one kind of diaper. Boy was I glad I did that. I thought I would love fitteds but they ended up not working as well for my toddler but I was in love with pockets and prefolds. I never thought I would like a prefold, it seemed like the most complicated when it actuality it is not complicated at all. Even my reluctant husband, Mark has become a prefold pro. I started out my stash with BumGenius 3.0, Knickernappies, Prefolds and Thirsties covers. I was hooked the moment the diapers arrived! Since then my stash has grown and changed many times. I love trying new diapers and I find that different diapers work for different situations so it is nice to have some variety. My oldest daughter Gabby is 2 years old now and I prefer mostly pockets and prefolds for her, my youngest daughter Gretchen is 5 months and I prefer fitteds for her. I have been married to my husband Mark for five years and I have a home childcare business. I ventured into cloth diapering for the cost factor alone but after a year of cloth diapering I have taken on other areas of green living and feel like it has so many benefits besides the cost savings (which is HUGE!). I look forward to contributing to this blog and sharing my personal stories as well as some of the knowledge I have gained on my journey! Please send me feedback and comments as you see fit! 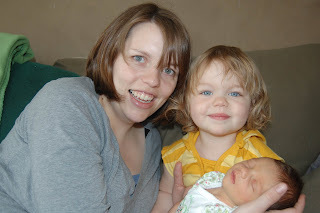 Me and my beautiful girls, Gabby and Gretchen, taken just a few weeks after Gretchen's birth. Visit our Madison location for a special new monthly giveaway! If you have a child ages 0-5, enter their name in a monthly drawing to win a free pair of BabyLegs of choice and have their picture taken wearing them and featured in our in-store BabyLegs display! We'll also publish the picture here on our blog! One entry per child per month please. Stop in at Nicki's at 739 N. High Point Road in Madison for more details and to enter! Kissaluv's Hybrid Contour Diaper is soft, easy to use and economical! They have elasticized legs and the freedom of using your own closure system. Kissaluv's Hybrid Contour Diaper is made of superior custom knit cotton fleece that is super soft and durable. Kissaluv's Hybrid Contour Diaper is one size - fitting babies 7 - 35 pounds! To adjust the size, simply fold or tuck the front and/or back to adjust the rise. The elastic at the legs is sturdy but gentle and will prevent blowouts. You can use Snappi, pins or a snug fitting cover for your closure system. Using Kissaluv's Super Soaker with this contour diaper will enhance absorbency. The fit will be trim, but the diaper will be super absorbent. Kissaluv's Hybrid Contour Diaper is available in Unbleached (seen above) and Kissaluv's colors: (top to bottom) Lime, Sky, Melon, Lemon, and Berry. You will receive ONE entry for EACH option below (you MUST leave a comment for each option saying what you did and where). This means you can get multiple entries increasing your chance to WIN! (each "Weekly Giveaway" may be different): 1. Become a subscriber of Nicki's Diapers Blog 2. Become a Fan of Nicki's Diapers Facebook page 3. Post a comment on Facebook about Nicki's Diapers including a link to any page on Nicki's Diapers 4. Follow nickisdiapers on Twitter 5. Tweet about Nicki's Diapers including a link to any page on Nicki's Diapers 6. Blog about Nicki's Diapers including a link to any page on Nicki's Diapers 7. Talk about Nicki's Diapers on a Forum including a link to any page on Nicki's Diapers 8. Grab one of our buttons and put it on your blog. *Contest ends Oct 8th at midnight and winners will be posted on Friday Oct 9th. Winners generated by random.org Winners must notify nicki@nickisdiapers.com within 1 week.